See, here I am with Pierce the summer before getting pregnant with the twins. I look happy. Alive. Skinny. Vibrant. Like I had just run 8 miles on trails. Effortlessly. Which I had. It was a gorgeous late August day in one of our nearby state parks, where we had rented a cabin. Now are you ready for this? It's ugly. This is real life, what carrying twins to full term and living without sleep for months and months and months can do to you. Viewer discretion is advised. 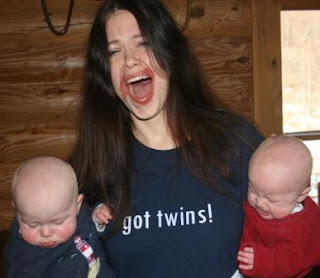 Somehow, I expect the ups of having two healthy baby boys are a million times better than the ups of methamphetamine. :-) Thankfully. I kind of know how it feels. OMG! You are friggin funny. I was so not expecting that wild woman shot! Oh my goodness you have made me laugh! I found you through Dory's Blog, oh my that woman on meth is crazy!!! 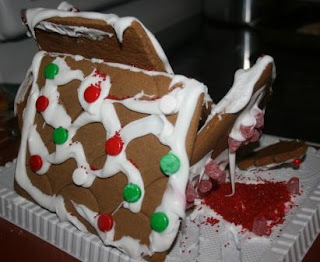 Your picture is really cute, and so is your gingerbread house. I also have twin boys they are 2 now. I hope you get some sleep soon, I think mine starting sleeping through the night around 4-5 months.